Posted on 5/17/2010, 5:21 pm, by jungrrl, under CrafTATstic Crafty Tattoos. I love vintage sewing machines! Obviously lindseymichelle does, too! 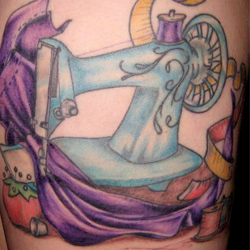 She has an amazing tat of a vintage machine in the middle of a crafting session. The draping of the fabric and all the little extras around the machine (lindseymichelle says the pincushion is her fave!) are fantastic! What a great little scene to keep with you. Have a crafty tat? Share it here and you might be featured!